This article originally appeared in Ten Da’at, Cheshvan 5749, pp. 14-16. Appears here with premission. The following is adapted from a paper presented at the June 1988 Torah High School Network Conference. Atmospheres are crucial determinants of the life force. Conducive atmospheres encourage and stimulate growth whereas noxious ones must be neutralized in order to sustain life. The atmosphere in our schools must be healthy and positive to promote meaningful growth, for students cannot develop in an atmosphere of negativism and conflict. As Torah educators we must remove hostility, anger, conflict and personal affront from the learning environment, thereby allowing our students to fully maximize their ability to achieve and succeed. There are three key areas of conflict that poison the learning atmosphere in our schools: religious vs. secular; home vs. school; and textual vs. spiritual. The first tenet of the modern Orthodox day school is that religious and secular foundations of life can be harmonized in thought, practice, and values. This philosophy, however, is far from realized in schools where tension and dichotomy are keenly felt, particularly between the religious and secular faculty. As each questions and belittles the priorities and attitudes of the other, neither can achieve the synthesis so dearly sought by modern Orthodox educators and leaders. To reduce secular-religious tension and jousting for academic priority, the school leadership must first clearly and unequivocally define the goals and position of the school as well as the type of students it wishes to attract and the ultimate values it seeks to instill. No school can successfully serve all students from all affiliations, and any claim to do so becomes fertile ground for future conflict. Reticence or ambiguity creates only temporary peace even as they incubate the seeds of misunderstanding and tension. Clearly articulated goals, however, do not preclude a tolerance for differing views. The effective administrator can both reduce tension by eliminating attitudes and discussions that inflame conflict between religious and secular staffs, as well as create an atmosphere of mutual tolerance, acceptance and respect. Constant motivation of the staff and articulation of the school’s position will gradually neutralize a negative atmosphere and release students from the uncomfortable and counter-productive position of being political pawns. It is both desirable and laudable that parents be concerned and involved in their children’s development. But successful parenting includes the ability to teach children that not all of their needs and wants will be attained, and that they must sometimes yield to the needs of other individuals or to the common good. Maimonides teaches that human beings, as opposed to animals, need a community for survival and happiness. Our Torah system, according to the Rambam, is built around the principles of creating harmony within our society – not a natural instinct with which we are born. Thus, our religious mandate is to overcome our natural inclinations by controlling our passions and working together for the common good. It is the role of the administrator to be concerned with the needs of the school as a whole, as well as with each individual student. Although parents cannot be expected to have this perspective, their overriding involvement with their own child often conflicts with the successful and healthy interaction that should exist between home and school. Not all of a child’s perceived needs and wants can be met in the school community. However, after appropriate personal analysis, a parent who decides to seek access to school authorities should find a network of communication in which healthy views can be exchanged. Many schools fear an erosion of their authority if parents are permitted to become involved. Parents, aware of this closed door policy, become alienated, disenchanted, and resentful. Mutual fear and distrust poison the atmosphere and affect not only the parents but eventually their children as well. The spirit of optimism and cooperation, the foundation of successful interaction, can be re-established with clear and open channels of communication. A network can be instituted via committees, class organizations, and access to responsible school authorities. This will provide the assurance that parents have a forum in which their views can be heard and responded to with concern, with seriousness and with honesty. Positive interaction between home and school can provide both with the confidence and strength that can lead to the increase of mutually beneficial commitment and loyalty. Many contemporary educators claim to be inspired by the glorious Yeshivot of the past where serious learning and intense spiritualism was inculcated into generations of Jewish leaders. Are our schools, however, maintaining that tradition? Would the Roshei Yeshiva of the past find our schools on a continuum with theirs? We have allowed religion in our schools to mimic secular studies. We write patterned curricula and routinely test our students, but are we also building and developing the soul and the spiritual capacity of our students? How many curriculum meetings and workshops are devoted to encouraging spiritual exercises? Without spiritual fire the curriculum, the testing, even the skills have no value other than academic. Our students may obediently memorize and chant but do not internalize and quickly forget. Spiritual development cannot be taught exclusively through texts and lectures. The excitement of spiritual growth and development emerges from an expansion of self-awareness and inner harmony. This must be conveyed through personal interaction, positive modeling and experiential workshops. Many adults anchor their Judaism around the synagogue and prayer – not around Talmud and learning. 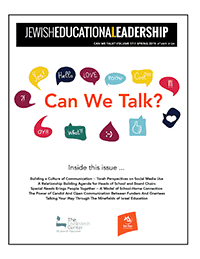 Have we prepared our students to find meaning and closeness in prayer and synagogue? Increased spiritual awareness would help mold them into spiritual beings, thus encouraging their desire for the study of Torah. We must balance our school program by instilling within each of our students a spiritual foundation upon which they can draw for the rest of their lives, thereby enabling them to find internal fulfillment, enrichment and comfort. As the negative conflicts within the school environment are dissolved and dissipated, they can be replaced by positive programs. Two programs that can assist in generating success and enthusiasm are a “Learner Centered” teaching structure and a climate of “Caring”. The Learner Centered teaching structure is built around the G-d given ability of a person to choose between good and evil. The role of the Jewish educator is to teach the young Jewish student how to evaluate the choices in life and to “Choose Life”. The Obedience Model focuses on molding students who will follow orders and rules. They are expected to fit into the school’s rules and expectations and any deviation is dealt with harshly. In this program the teachers are the center of all authority and control. This control is reinforced through strict discipline and codes of conduct. The teacher threatens, scolds, insults and assails the dignity of any student who does not conform. This system of control results in a tug-of-war between students and teachers/administrators. Every loss of dignity invites a revengeful attempt to deny the teacher his or her dignity. This cycle is obviously counter-productive to building a proper atmosphere. Furthermore, it limits student initiative while protecting the authority of the teachers. What lessons are these students in fact learning? On the moral level, they are concerned with not getting caught. If caught, the results can be so unpleasant that the first defense is to blame others, thereby refusing to accept responsibility for their own actions. When finally confronted by the evidence, rather than accept responsibility, they offer any excuse to justify their actions. Furthermore, every student quickly learns that the system must be beaten in order to succeed. It soon becomes a matter of survival, degenerating into a concern solely for one’s own self. Cooperation between students, and certainly between students and teachers, totally disintegrates, so that when faced with a crisis situation students attack, rather than assist, each other. Teachers, on the other hand, find themselves confronting unruly and argumentative students. With the excitement of teaching gone and with little support from the administration, by mid-term teachers face passive resistance – uncompleted assignments, continuous disruptions, inadequate supplies and constant guerrilla warfare. The objective of the Responsibility Model is to teach students how to make correct choices and to be responsible for the outcome of those choices. Instead of direct rules, students are given a choice of alternatives as well as the consequences of choosing each alternative. The teacher becomes an advisor rather than a disciplinarian. Students learn that all decisions have consequences, not for the teacher, but for their own self esteem and advancement. This gives them a sense of control over their lives, and an ability to accept responsibilities. Teachers do not threaten their dignity, but rather assist them in attaining their goals. Teachers can ensure success by promoting sensible rules, by consistent follow-up and by presenting predictable outcomes that are clear and specific. Consequences must be presented in a range of alternatives that are not viewed as punishments and that are related to the rules. What about students who reject this model? The successful teacher uses this deviation as an opportunity to teach and shape their abilities to choose more wisely. Students can be reached by focusing their minds on a clear articulation of their personal goals. This sharpens the positive and negative courses for achieving those goals. It is this ability to articulate goals and clearly evaluate the means of reaching those goals that forms the foundation for a lifetime of growth and moral virtue. After a certain age children spend more time interacting in school than at home. It is in school that lessons in caring and cooperation are developed and nurtured. Yet, are we directing our teaching toward developing the caring and cooperative values within our students? Caring is a quality that is immediately discernible, it cannot be surface deep. Unfortunately, some teachers and administrators were not brought up within a caring family or school environment. Their own personal growth is limited and they are unable to express the range of empathy and caring that is necessary to build an atmosphere of mutuality and cooperation. Because caring can only be taught through modelling, schools must make this inner “caring” quality an important requirement for evaluating and hiring teachers. A teacher begins to transfer this concern for caring through a constant flow of praise and encouragement for students exhibiting appropriate behavior and effort. By conveying this message of caring a teacher also helps a child reinforce his/her self esteem – a critical and vital foundation of healthy growth. A lack of self-esteem, on the other hand, breeds insecurity and destroys the ability to care and cooperate. There are many forces that continually attempt to destroy the dignity and self-esteem of each human being. When a school, however, permits this to take place within its confines – whether from administrators, teachers or other students, it erodes the moral foundation that is necessary to sustain a child for life. A school that does not zealously prosecute all instances of personality attack soon finds itself degenerating into a place where students lack respect for each other and exhibit disdain for teachers, administrators and even the school as an institution. Intellectual success without a corresponding feeling of self-confidence and self-esteem results in unbalanced development. It is the responsibility of the school to reward those expressions that reinforce the caring, positive atmosphere and vigorously attack all expressions of negativism, conflict and personality erosion. This orientation and direction must begin at the top. It is this dimension of leadership that is needed from our administrators – leadership that establishes priorities, reinforces values, promotes a positive atmosphere and encourages spiritual growth – leadership that cares. RABBI HECHT is the principal of the Middle and Lower Schools of the Hebrew Academy of Greater Washington, in Silver Spring, Maryland. MR. PINCHOT served on the Boards of Education of the Hillel Torah Day School, Skokie, Illinois and the Hebrew Academy of Greater Washington, Silver Spring, Maryland.